Concomitant chemotherapy and radiotherapy is the first treatment choice for most patients with stage III non-small-cell lung carcinoma (NSCLC). However, only about 30% of patients are alive 5 years after concomitant therapy and there is an unmet need to identify new treatment options in order to improve the prognosis of patients diagnosed with locally advanced NSCLC. Based on the good results in advanced disease, immunotherapy provides a very promising approach. The monoclonal antibody nivolumab is an immune-checkpoint inhibitor that prevents the interaction between the PD-1 receptor and its ligands. 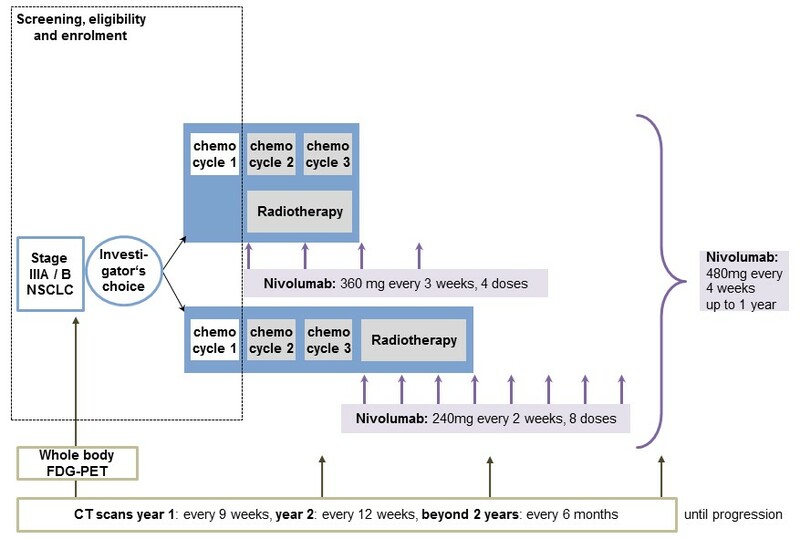 The aim of the NICOLAS trial is to assess the safety and efficacy of nivolumab when administered concurrently to standard first-line chemo-radiotherapy in locally advanced stage IIIA/B NSCLC.